I don’t need to tell you that growth within a business is important. The difficult part for many green industry businesses is determining the steps they will take to bring their business to the next level. Lucky for you, there are plenty of simple steps your business can use in stepping up its game. Anyone can create a business, but not everyone can create a business that stands out. Being different is critical in getting recognized and establishing a client base. Many companies struggle with finding ways they can establish themselves as different or unique, but the solution is simpler than you may think. Pick one thing your company does well and make it your own. Take Jimmy John’s for example. Lots of places deliver sandwiches, but Jimmy John’s has made it their own by focusing on the promotion of their delivery service. So what part of your company is your selling point? Pick an angle, play it up, and use it to set your business apart from the competition. Imagine you are an Olympic swimmer. You’ve trained hard to get in the best shape of your life, but there is no way you are jumping in the pool without your speed suit, swim cap, and goggles. These are the items that you use to take yourself from a good swimmer to a true competitor. The same can be said with your company. You’ve worked hard to get your business to where it is today, but just like the swimmer, there are tools you can use - like HindSite's field service software - to cut time and really help to streamline your business processes. Take a good, hard look at your company. What things are taking up most of your time? Target these time consuming activities by looking for systems that can take some of that work off your hands and utilize these tools so you can take your business from varsity to Olympic level. In today’s electronic world, establishing personal connections is hard. But that doesn’t mean it isn’t worth your time. Being a business owner means making each and every customer feel truly valued, and what better way to do that then by establishing a relationship with him or her? Learn names, make conversation, and be sincere. If you truly attempt to get to know your customers, your service will become so much more valuable to them. Not only does getting to know your customers help them remember you next time they need your service, but it makes them more likely to recommend your business to their own friends and families. These customers are the ones that support your green industry business, so make sure you are supporting them by showing your appreciation through customer loyalty programs and by taking the initiative to get to know them both professionally and personally. 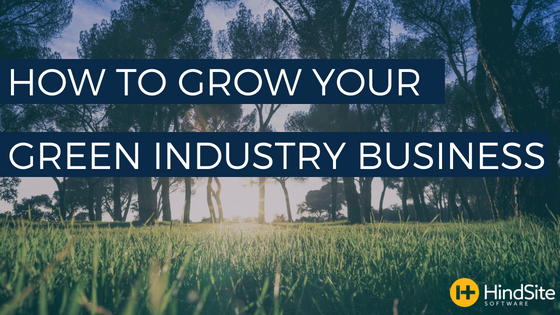 Taking a few minutes out of your day to get to know the person behind the phone call or email can go a long way for your green industry business. Ever heard the phrase ‘happy wife, happy life?’ The same can be said for employees. Having employees who are passionate about the company they work for and the service your green industry business promotes is essential for a successful business. So don’t focus so hard on your business that you forget the people who are working right beside you in making it a success. Take the time to reward your employees for their effort and dedication, as well as to inspire and excite them about the new developments your company is making. Keep your employees in the loop about company news and developments and allow them to join in the decision-making process. By truly valuing your employee and their opinions, as well as in rewarding them for their service, you are giving them the passion and inspiration they need to continue doing great things for your business.